Scroll down to view a variety of graphic design and illustration projects. The project shown here is a result of a relationship that began years ago with Marché – Restaurant and Cafe. While working at a local design firm, I was the lead designer to develop a logo for Marché. Following that I designed business papers, brochures, menus, menu boards and other signage and advertising materials. Because a relationship had been developed, when a similar project for a new business came up, the client called. I worked as an independent contractor for Marché – Provisions, located at Fifth Street Public Market in Eugene. A logo was developed first, indoor and outdoor signage, and everything in between. 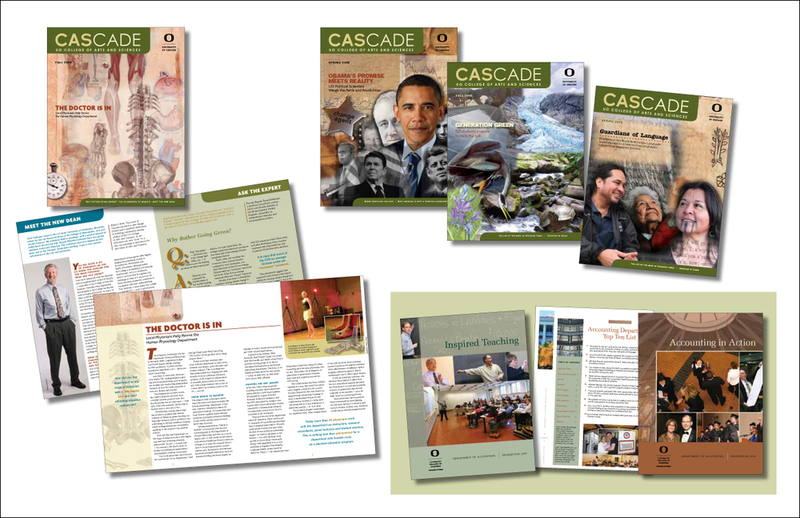 The CASCADE project included designing a new look and feel for magazine and then producing a multiple page publication. CASCADE provided an opportunity to design original mixed media college illustrations. This project included design and layout of the King Estate cookbook, with collaboration between the writer, chef, food stylist, photographer and all of the production staff in both the U.S. and Hong Kong. The project included traveling to Hong Kong for the press checks and overseeing the production of the final product. An Elephant Would Be Wonderful, written by Greg Ahlijian. I enjoy working in a variety of illustration styles that range from realistic graphite pencil illustration, pen and ink, woodcut look and fine art. Also, find samples of my original mixed media art, often used as a form of illustration. I created the design and layout for this CD project, which included CD, Tray Card and Insert. The graphics for this project are my original art of collage and mixed media. This design and layout of a holiday CD project, allowed for the opportunity to create an original illustration, with watercolor and colored pencils. All logo designs here were either created for my own clients, or a collaborative process while working at a local design firm. This page represents design and layout of brochures to announce workshops being offered by the University of Oregon Executive Education from the Lundquist College of Business. My mixed media artwork was created with the idea of using the image as a graphic element throughout the brochures, cropping sections to create a variety of textures and visual interest.